We used to grow Tart (Sour) Cherries for the processing market, but have pushed most of the trees out, saving only enough to hand-pick for our market. Our main variety is the traditional pie cherry- Montmorency. 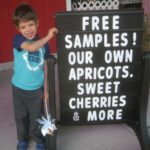 Our tart cherries should be available throughout the month of July. We have also have a new variety from Hungary- Balaton. It is firmer and sweeter than a Montmorency and has red juice. It is wonderful to eat fresh, and makes terrific pies, crisps, cobblers, and jams.